Around fifteen volunteers gathered on a cold Sunday in London to pack the generous donations of humanitarian aid that has been collected by The Together Plan throughout the year onto a forty-foot long lorry. These items, which include much-needed clothing, electrical equipment, Judaica, welfare supplies, educational resources and toys, have been collected throughout the year and meticulously sorted for The Together Plan by a team based at Pinner United Synagogue. This Sunday our volunteers crammed hundreds of the sorted bags onto a ten-tonne lorry currently on its way across the continent of Europe to help disadvantaged communities in Belarus! 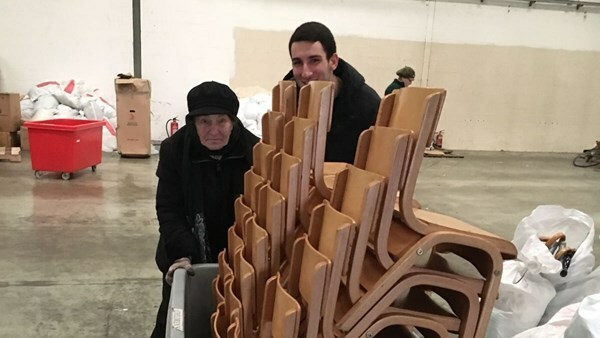 In attendance at the lorry loading day was 82-year-old Frida Reisman from Belarus, chair of the Minsk Ghetto Survivors’ Association, who gave the other packers a run for their money in her enthusiasm and strength. We were also lucky enough to be joined by some of our regular sorters and by Matthew Lloyd-Winder, as well as by Neil Clowes and his team from Apt & Able removers and handymen, who once again generously donated their time, resources and expertise. A number of our Youth for Youth volunteers worked with Frida, Neil, Matthew and others on this fun and productive project to load the lorry.